Are you familiar with them? Believe it or not, the first time that I made a dump cake was about two years ago, and I’ve been hooked ever since then. It’s one of the easiest (and most delicious) desserts that’s popped out of my kitchen. With just a few ingredients, practically no prep time, and a little lovin’ in the oven, you have a cross between a cobbler and cake, all warm and gooey and just waiting to be devoured. Now, if you’ve tried (or made) a dump cake before, then you know what I’m talking about. But, if you’ve never heard of it before, the name might sound a little strange. But, trust me…it’s soooo good! Since I’ve never shared my own dump cake with you before, I thought I would create one that captures the flavors of fall and uses a slow cooker. Sounds pretty good, doesn’t it? And if you’ve never used your slow cooker for dessert before, then now is the time to start. 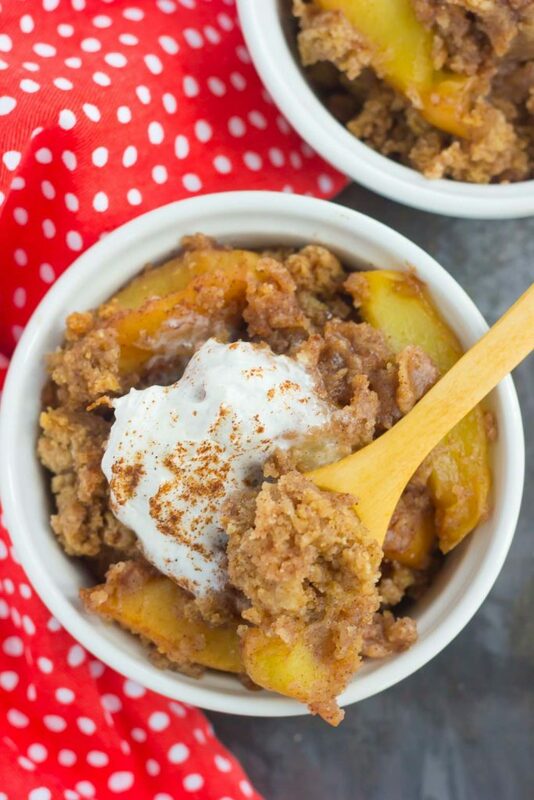 This Slow Cooker Apple Cinnamon Dump Cake will make you a firm believer that all desserts should be made in the slow cooker. And did I mention how easy this dump cake is to make? The title says it all. You simple dump the ingredients into your slow cooker, set it, and forget it! The hardest part is peeling and slicing the apples, which really isn’t hard at all. 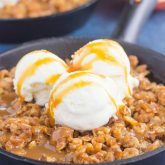 I like to serve this Slow Cooker Apple Cinnamon Dump Cake with a big scoop of vanilla ice cream or a generous topping of whipped cream. It kind of melts into the cake, making it even more irresistible and delicious. 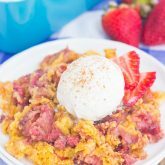 So grab those ingredients, your trusty slow cooker, and make this easy and oh-so yummy dump cake today. 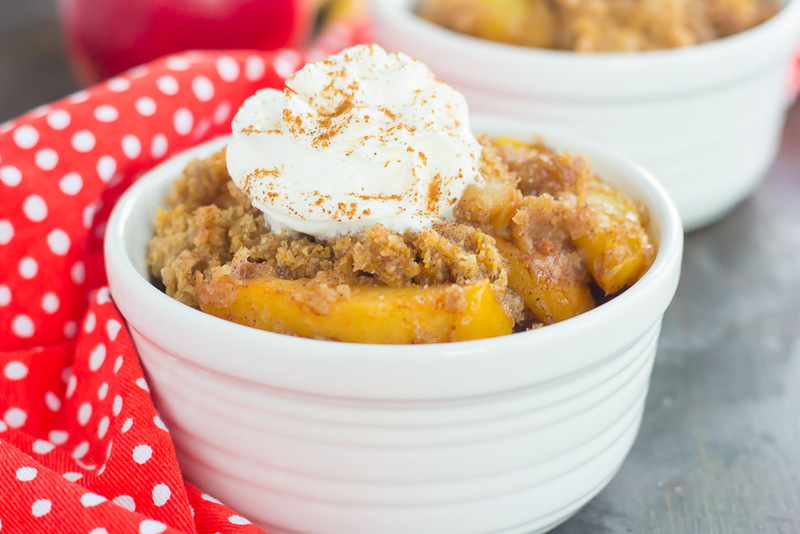 It’s a cozy fall dessert that you need in your life! 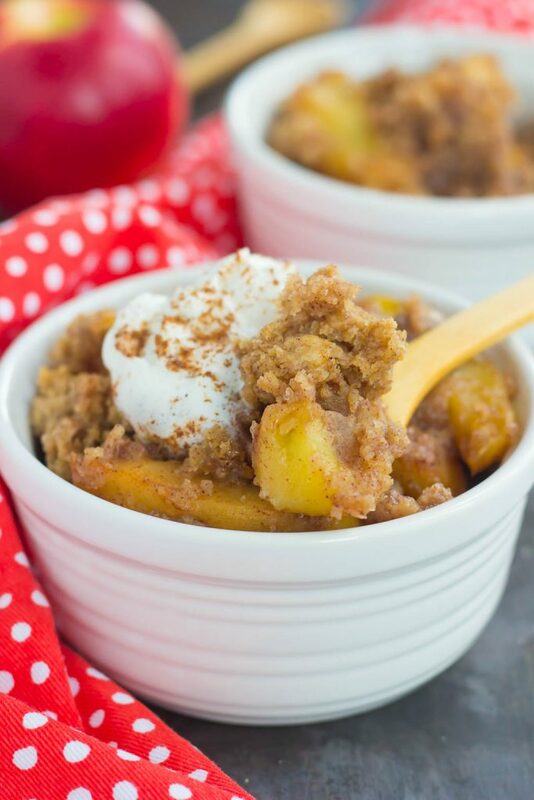 Subscribe to my YouTube Channel to see how easy this Slow Cooker Apple Cinnamon Dump Cake is to make! Looking for more apple desserts? I’ve got you covered! Grease your slow cooker with non-stick cooking spray or line with a slow cooker liner. Placed sliced apples in bottom of slow cooker. In a small bowl, combine the white sugar, brown sugar, and 2 teaspoons cinnamon. Sprinkle mixture over apples. Lightly toss to coat. In a medium bowl, combine cake mix and remaining 2 teaspoons of cinnamon. Add in melted butter and mix until crumbly. Sprinkle cake mixture evenly over apples. Cook on high for 2-3 hours, or on low for 4-6 hours, until edges are set. Center will be slightly wet. Serve immediately with vanilla ice cream or whipped cream, if desired. I've never heard of 'dump cake' before, but I just love the name. Kinda puts a little smile to my face :) I have got to try this recipe. Love that you just put everything in the slow cooker and way to go! So perfect when having family or friends over. And ice-cream and whipped cream? How about both ;) I can only imagine the lovely smell going through the kitchen as this cooks. Pinned, of course! Have a fantastic week, my friend! Thanks, Dawn! I first heard of dump cakes a few years ago, and have been hooked ever since! Hope you have a wonderful week, too! Good job on the video, Gayle! And this cake is right up my alley -- slow cooker and EASY! Sounds perfect for fall! Anything that uses the word cobbler in its description has my attention! This looks so cozy and delicious!! Thanks, Annie! 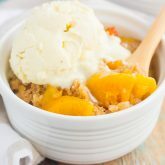 It's not quite a cobbler, but similar, and so easy to make! This looks amazing! I love simple desserts like this- especially ones that use some already prepared ingredients like cake mix! Love it! Ice cream is required with this dessert! :) Thanks, Christin! This is the perfect easy fall dessert! I actually don't know if I've ever made a dump cake and now that feels wrong. Lol. I'll definitely have to try this one! My cousin made a pumpkin dump cake for Thanksgiving several years ago and it was the first time I'd ever had one. It was so delicious that I couldn't get over it! This looks amazing with the apples and I love that you can make it in a slow cooker! Thank you, Marcie! I'm hooked on slow cooker dump cakes! I love that you made this in a slow cooker! Vanilla ice cream is the perfect topping for a yummy cinnamon apple cake! Okay, don't freak out, but I have never made a dump cake before. I HAVE seen them floating around for years, but I have yet to try one. I know, SHAME on me! ;) Clearly I need to hop on board the dump cake train, and this one is THE perfect one to start with! I'm obsessed with cinnamon and apples, so I AM going to DO THIS! Plus a few scoops of vanilla ice cream on top are ALWAYS enticing! Pinned! Cheers! I first made one a few years ago, so don't feel bad! But once you try it, I know you'll love it. Thanks for the kind words, Cheyanne! Gayle, I love this dump cake!!!! LOVE that you made it in your slow cooker!!! I'm going to try this! Thanks, Alice! It's so easy and so good! This looks delicious! Can't believe I've never had a dump cake before! Now with this awesome recipe, I'll definitely try it. This looks so good Gayle!! I've never made dump cake before and I'm missing out that's for sure. This dump cake looks so yummy and easy, which I love. Love your video too Gayle! Great job. Thanks for the sweet comment, Cyndi! 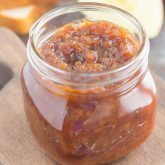 how easy and looks delicious!! This looks SO awesome, Gayle! I love that you made it in the slow cooker! I just tried making my very first dump cake last month and I can't wait to try your apple version! Loved your video too! The visual of melty vanilla ice cream all over this apple cinnamon goodness has me drooling! I have yet to try a dump cake, but I just love the sound of them! Especially an apple version. I have a feeling this would make a fantastic (and super easy!) Thanksgiving dessert! It's so good, Keri! And I love your thinking, so perfect for a Thanksgiving dessert! I love a good dump cake and am alll about any desserts made with apple. SO delicious!! 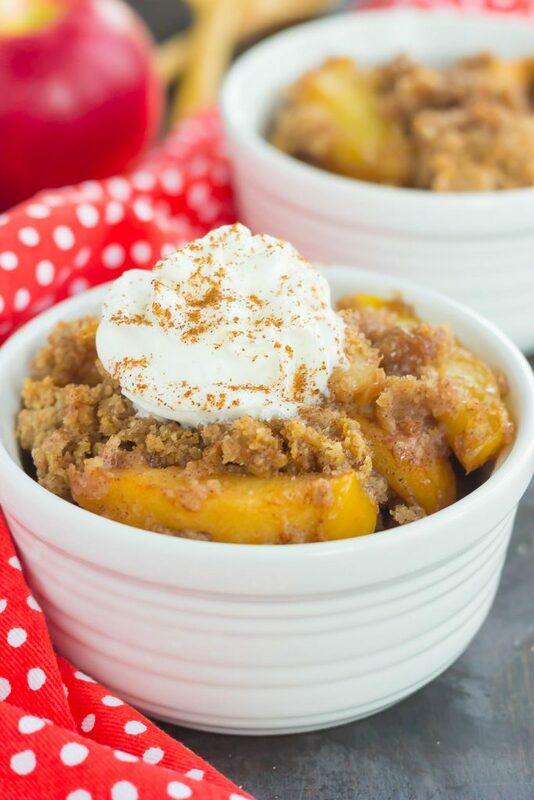 Any kind of apple and cinnamon dessert gets the thumbs up for me and I love that you can do it in the slow cooker too. Even better! Thank you, Dannii! Slow cooker desserts are so fun (and delicious) to make! Would you believe that this girl has NEVER made a dump cake in her life?? Where has this gorgeous apple-filled cake been my entire life? Totally drooling and craving this for breakfast! You've got to try this, Sarah! It's SO good! I've never made dessert it the slow cooker before, but this looks like a wonderful place to start. This is a perfect fall dessert! Hi Judy! I've never tried it with yellow cake mix, but I think it would turn out just as good. Thank for stopping by and hope you enjoy!